It's always easier to get by with a little help from your friends! Goats are complex creatures who have been known to get excited pretty easily -- and this goat in particular is pretty stoked that he's found a new way to reach the branches of the tasty crabapple tree in the back yard. The solution? His patient friend, the donkey. 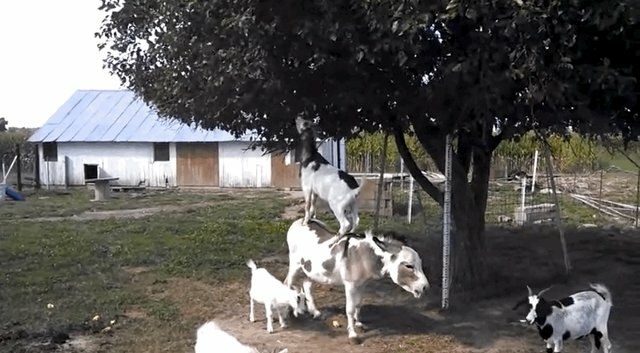 Once Donkey let Goat hop up on his back, a whole new world of snacking was opened! Goat was even able to knock a few pieces of fruit down for his buddy -- after all, it was only fair.